I find it surprising how many organisations don’t realise the importance and benefit of effective communication. For me, effective communication is a key success factor. Its benefits can, admittedly, be hard to directly measure. But its power in shaping outcomes, company culture and staff engagement should not be underestimated. Communication as a term encompasses the written, verbal and expressed (non-verbal, or body language) communication that occurs on a daily basis at every level of an organisation. As management styles move towards a more collaborative approach for high performance teamwork, communication becomes even more important. Today’s managers need these softer skills to make them an effective leader. Effective communication can be a great motivator. Motivated staff are more productive. Something as simple as praising staff for good work leads to improved employee engagement – a key ingredient in motivation. When employees feel informed of a company’s direction and vision, they feel more secure in their role. They care about the future of the business and want to contribute. The way we do business has changed dramatically over recent years. Through innovation we must learn to adapt to that change. Businesses must communicate this need for change to employees. Failure to get the whole company on board may have catastrophic effects. 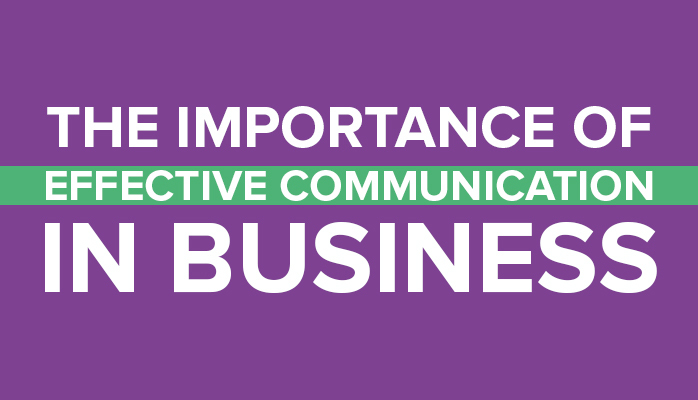 Effective communication not only readies a business for change and innovation, it can facilitate it. If staff feel comfortable and able to share their new ideas, great things can happen. You never know who the next top idea is going to come from! Related to improved productivity, but worth a mention in its own right. Effective communication within a business, and also with suppliers and customers, helps keep projects on track. If everyone understands the task at hand and their role in delivering results, problems are solved more quickly resulting in less wasted time and energy. The success of a business is down to being able to deliver what customers want. Opening the lines of communication helps convert prospects into customers, ultimately boosting the bottom line of the business. Improved customer service can turn any situation around, keeping your company reputation positive – dissatisfied customers have many ways of publicly sharing their grievances these days! Effective communication ensures a good flow of information, both within the business and in terms of customer feedback. This can be invaluable when it comes to making the right decisions to enable business growth. Continuous improvement is critical for future success – there’s much speculation that Chief Improvement Officer could be a role for the future boardroom. Great communication will undoubtedly be one of their essential skills. When staff are reminded of their achievements, they feel they are working towards a common goal. This creates a sense of unity. Understanding the individual responsibilities and expectations that contributes towards the achievement of that goal improves the overall attitude and culture within a business. Good managers and leaders believe in building trust and respect through honesty and empathy. Effective communication is an essential ingredient. The resulting inclusive atmosphere means that all employees feel valued, presenting a positive attitude. If times do get tough and decisions need to be made, transparent leaders will have an easier time explaining why. A happier, healthier workplace built on mutual respect will attract and retain top staff. That saves you the time and money involved in recruiting, replacing and re-training new staff. The main starting point is to acknowledge that you need to communicate the same core message to vendors, suppliers, customers and employees. Consistency is key. There are lots of tools, tips and techniques for improving communication. Mastering these skills becomes even more important in our digital age where teams are often virtual. We’ll share a few ideas in our next article.